A pretty interesting interesting situation is what you get. And if you film it you get Big Tribal Brother: A documentary. When I go into the supermarket and walk along the aisles packed with every type of food you can imagine, I often wonder: What would, say, an Eskimo think if they saw all this? Personally, I’d be keen to watch a documentary just on that: an Eskimo in a supermarket. I mean, it doesn’t even have to be an Eskimo – any native tribesman or tribal warrior would do. But why not let’s go wild and get a group of indigenous tribesmen, of different origin, together? Then take them to the supermarket. Or the cinema. Or laser quest. 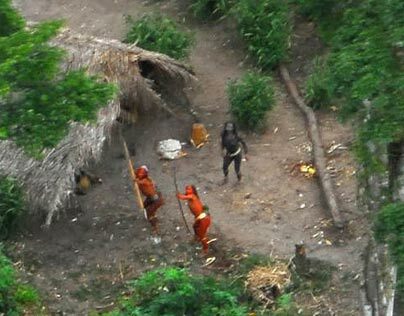 According to Survival International there are over 100 tribes around the world who continue to reject contact with the outside world. Amazingly, some of them have not yet had first contact with anyone from outside their small tribe. It almost defies belief that some societies on Earth have been through hundreds of years of agricultural, industrial and technological revolutions, which indigenous people in jungles still know nothing about! A couple of hours after the first fly past had sent them scattering into the jungle, they had painted themselves red and came out fighting. Again, the longbows. Now I’m not suggesting we get gentlemen like this involved. If these tribes reject contact with the outside world, they could well be better off that way. Apparently they’d be fairly likely to die from catching a cold off the film crew, which would run counter to the idea for the documentary. But there are plenty of tribal people who’ve had contact with the outside world yet still haven’t been anywhere near a supermarket. And I reckon getting a few such tribesmen together and showing them a bit of the developed world would be a totally feasible idea for a documentary. Perhaps more interestingly: what will an aborigine from the Amazon say to an aborigine from the Australian outback? How will they interact? I think it would be an eye-opener for natives, viewers and film-makers alike. We could even make a real effort and channel some of the profits made from this documentary back into charities like Survival International that work to protect tribal people, or environmental charities that preserve the increasingly endangered places these people are indigenous to. But let’s not really make it Big Brother style eh? They might wear fur, they might be from West Papua, but we don’t need to make them our New Guinea pigs. Can’t be bothered to make the documentary or follow me to Amazon, but still love our big tribal brothers? ideasexist.com is very informative. The article is very professionally written. I enjoy reading ideasexist.com every day.